Federal budget cuts have forced the Air Force to cancel performances by its Thunderbirds precision flying team for the rest of this year, including its scheduled stint on Long Island on Memorial Day weekend, officials said Tuesday. 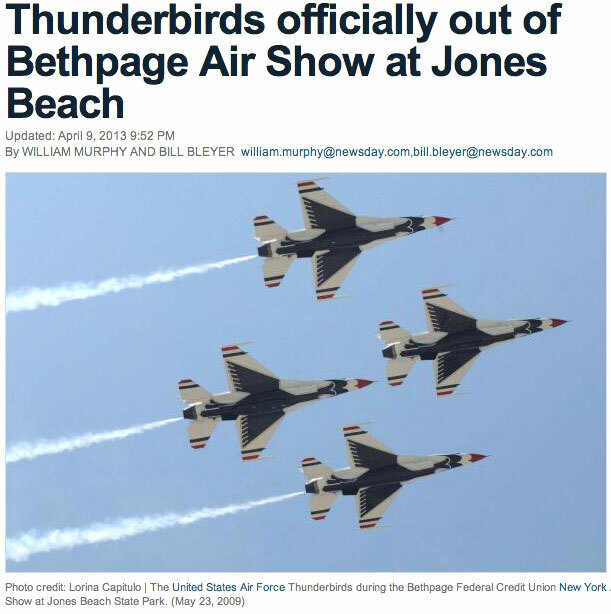 ...."The Thunderbirds have notified us that they have canceled their season, so we will not be seeing them at the Bethpage Air Show at Jones Beach," said George Gorman Jr., deputy director of the state Office of Parks, Recreation and Historic Preservation. 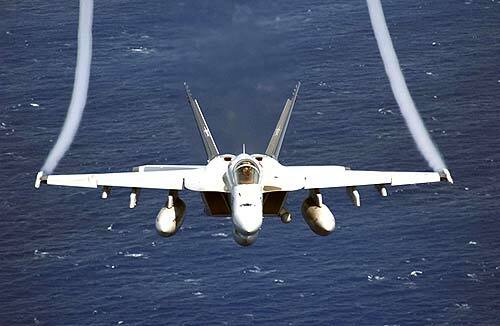 ....The Air Force had held out the possibility earlier this month that performances might resume after April 1, but Capt. 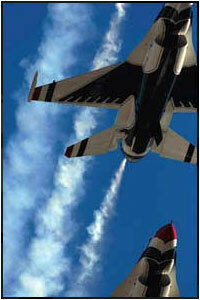 Bryan Bouchard, an Air Force spokesman, said those performances had been scratched for the year. 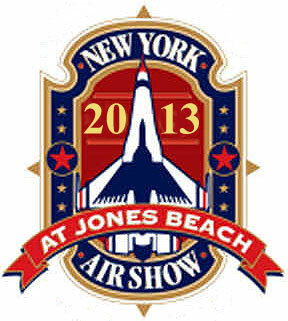 However, while the U.S. Military performers may be grounded, the Bethpage Air Show at Jones Beach will go on. 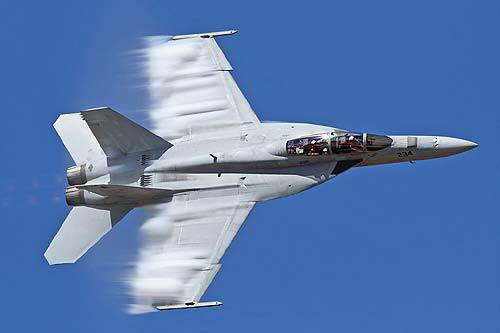 The 10th Anniversary show taking place Memorial Day Weekend, will have world class lineup of civilian performers as well as a second- time appearance by the Royal Canadian Air Force Supersonic F18 Demo Team. Performances by the Geico Sky typers, John Klatt, David Windmiller, the Warbirds and Sean Tucker among many others will wow audiences with their fast paced maneuvers and unique capabilities. 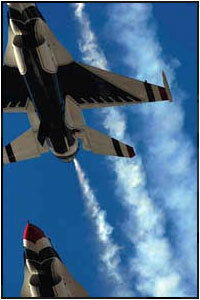 Each year, the air show greatly contributes to the Long Island economy bringing in millions in revenues. 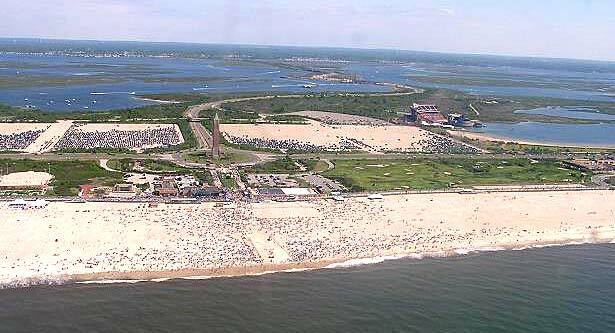 As we continue to recover from Hurricane Sandy, the show will certainly help kick off the summer tourism season and help draw air show enthusiasts and fans back to our beautiful beaches following the storm. The American Air Power Museum, Republic Airport and Jones Beach are still expected to draw large crowds to celebrate the 10th anniversary show. NO PETS. Of course, this excludes animals that aid the handicapped. Unless that animal happens to be a ferret, and if you are using a ferret to lead you around everywhere, you will probably have trouble getting to the show in the first place.